Tools are processing units that operate on specific data elements. From the Java point of view, a tool is an implementation of the Tool interface. Tasks are examples of tools within HIPE. In this case, TaskTool is used under the hood. See the topic on WritingTasks for details. If a data element is selected, a list of tools that can operate on that element should appear. 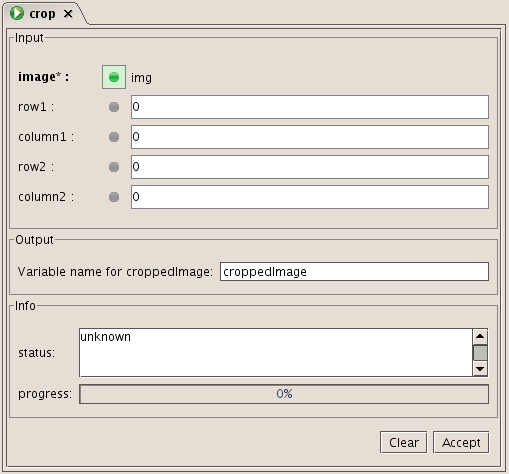 Double clicking on the tool will open an associated view for settings parameters. Otherwise the first (added) input parameter of your task will be its prime input. The prime input is the one that "decides" if your task can be applied to some variable. For your task to appear in the Applicable category whenever the user selects a suitable variable, you still need to define a Validator. See Validating prime input below. Tasks without any input cannot be registered and should not be used (create a parameterless function instead). For naming tasks follow the Java conventions, that is, use camelCase and avoid underscores: reduceLight is valid, reduce_light is not. HIPE displays info log messages for invalid task names. 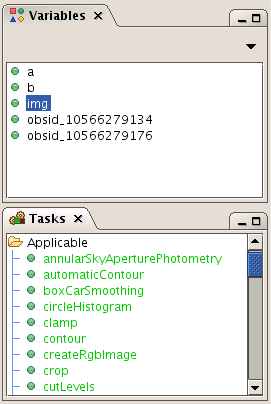 Note that task names are used as variable names (of type Task) automatically created when starting HIPE. In most cases, the type of the prime input is not enough to determine whether a task is applicable to a variable. Your task may only run on a SpecificProduct if it has certain contents: a typical example is a SPIRE task operating on an ObservationContext: clearly, such task should not be listed when a HIFI observation is selected. Note how the validation logic is now within the parameter validation block, rather than in the preamble or execution block of your task. One advantage is that the execution block of your task can concentrate on the core algorithm. A validator is mandatory for the task to appear in the Applicable category of the Tasks view. If your task really is very general and applies to a given variable type with no exceptions, use TaskParameter.TRUE_VALIDATOR. There are also support classes for writing common validators: AnyOfValidator, InstanceOfValidator, PredicateValidator, RangeValidator, RegexValidator in package ia.gui.apps.validator. Please, do not implement ParameterValidator interface directly as it will block extension of it: use ParameterValidatorAdapter (that also detects some validation problems). Note that your validators must be fast, self-contained (with no visible side effects) and not use I/O : they are called frequently and from multiple threads, including the EDT in the case of GUI validation. You can veto appearing in Applicable in Tasks View by overriding Task.canBeApplicable() to return false. This applies, for example, to tasks whose primary input is a number or a String (and they have/need validators). The first section (Inputs) is implemented with a SignatureComponent. Parameters are listed in two columns. HIPE lists the parameters from left to right and top to bottom. If a single input or output parameter is present or if its gui is detected as "big" (for example a JFilePathModifier), it fills a whole line. 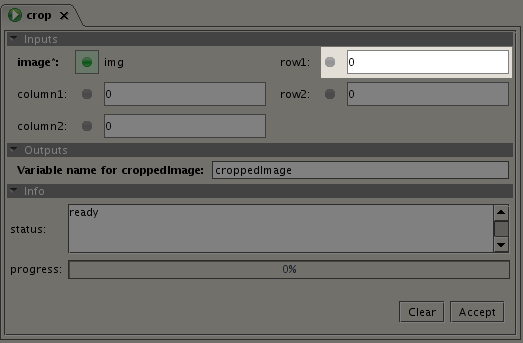 A parameter may need several input fields (see for instance the angle parameter of the rotate task, in the figure below). You may only want to provide a sub-set of parameters (and leave the full set to expert users on the command line). 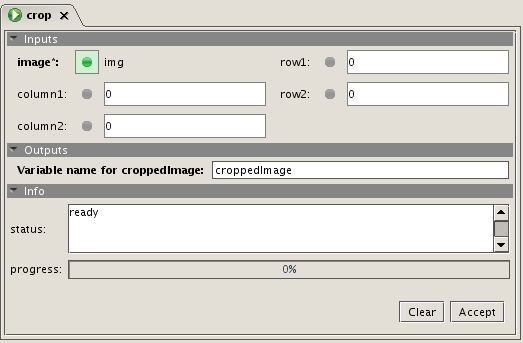 You may want to organise your parameters by putting a border around a group of parameters. You may want to have more informative tooltips, labels or even input fields that are more suitable to your task. In the default TaskSignatureComponent (JTaskSignatureComponent), each input parameter of a task corresponds to a pair of label and Modifier shown in two columns. 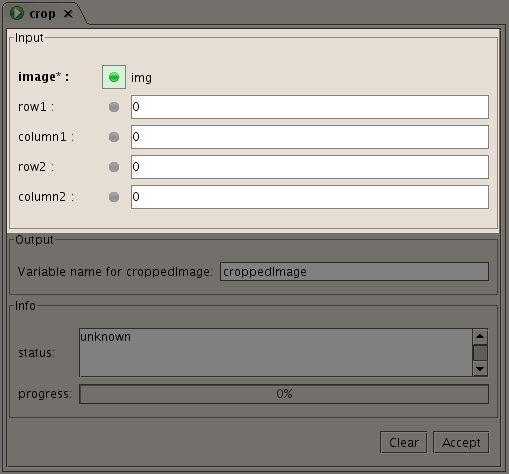 HIPE adds Modifier objects according to the types of the input parameters in the task signature. At the left hand side of each modifier there is a kind of label with the name of each parameter (TaskUtil.getDecoratedLabel) that also has contextual (right mouse button) commands. HIPE provides modifiers for basic types Boolean, Integer, Float, Long, Double, String and few more, so there is still a lot of room for improvements and contributions. You can find the general available modifiers in the herschel.ia.gui.apps.modifier package; please consult the Javadoc of your HIPE installation. If no specific modifier fits your task parameter, the default modifier will be used. The default modifier only has a dot to drop variables. 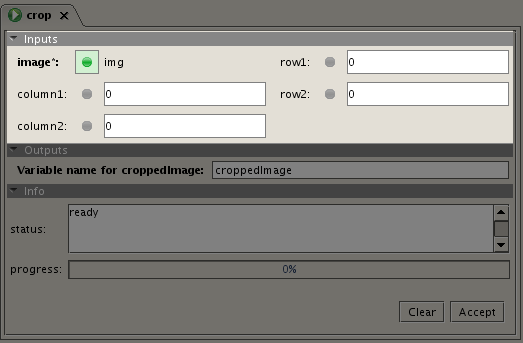 Others modifiers include an editor at the right of the dot to enter values. You can implement a custom Modifier and register it in the system to be used whenever a parameter of the registered type is used. You can also write your specific Modifier for any of the already registered types. In that case, you can create and assign your modifier (and listeners...) to your parameter in Task.getCustomModifiers() see Registering a modifier. Not all modifiers are registered: for example if your parameter is of type String but will represent a file (path) the system will choose just a JStringModifier, so you will have to explicitly associate your parameter (name) to a JFilePathModifier in Task.getCustomModifiers(). Also, if you want to tweak a (registered) modifier or add listeners between them you will also have to use Task.getCustomModifiers(). Examples of this include using a specific constructor or update modifiers when a linked modifier is changed. While you can always write SomeTask(param = null) on the command line, using a task dialog you will just get SomeTask(): modifiers use null to signify that they have no value and task GUI command generation interprets this as "not using this parameter". Modifiers have no notion of the optionality of parameters (or default values): if they have a valid value, they will return it. Task command generation for GUIs will not generate a parameter assignment if the value equals the default. 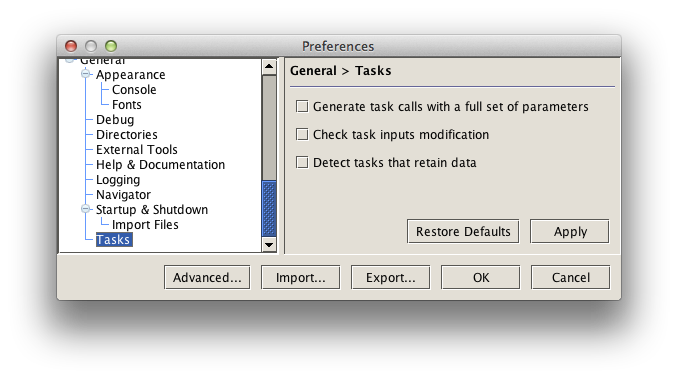 See Task Preferences to change this default behaviour. Modifiers will mark as erroneous any variables incompatible with the type (dynamically) and validator, but will neither reject nor remove any variable dropped. Only instances of JDefaultModifier (the default modifier) will listen to VariablesUpdatedEvent (object state been modified) by default. This behaviour can be controlled with the new method setListenUpdates of AbstractModifier. This is useful if you have specific modifiers whose validators check state (for example, the parameter table of simpleFitsWriter requires a non-empty table). The Log View upon task execution. The Outline View when a task is selected in the Task View. The Console View if you execute a print taskName. HIPE now supports the generation of task commands from GUIs with default values included: default values must be fed back in string form into Jython so these parameters must produce a valid Jython expression that maps to the default value. If that is not the case errors would be produced when invoking that task with full parameters. To avoid these errors, if there is not a converter different from the default one for the type of this parameter, the framework will generate a safe string (taskName.getParameter(paramName).defaultValue). This is not informative to the end user so, you should provide the Jython string representation of the default value of your parameter by using TaskParameter.setDefaultValueString(String). To fully support editing modifiers, that is, task parameter GUI elements that allow to generate/edit values (versus just passing the variables) must provide full support for generating Jython values. Most basic and usual types are supported but if this is not the case then you need to provide a Jython converter that supports your type. The mechanism for showing defaults does not rely on toString() working for all types, so it generates safe Jython to avoid unwanted errors. For composite types (arrays, collections...), the system may fall back to using toString() for the elements which may produce a bad default string. In this case, you have to provide a proper __repr__ or a Jython Converter for the element type. The type that needs the converter should define it (in the same module) if possible. Alternatively, the type can implement __repr__ (importing Jython). If the module where the type is defined cannot import share_interpreter (where JythonConverter is defined) then, by default, it should be share_interpreter (or the "next" module "above" share_interpreter that already imports the type) the one that defines the converter. A converter cannot be overwritten (but one can be registered for a subclass). This prevents that some client module can break more "basic" converters. Extend AbstractJythonConverter instead of implementing directly the JythonConverter interface. Your converter should call other converters for its elements (rather than doing it itself). Support of drag and drop features (by indirectly extending setVariableSelection and getVariableSelection in the ia.gui.kernel package). Support object inspection (via the setObject and getObject methods). If registered in the Extension Registry, providing an empty constructor. Be aware that the registration is system-wide, so it overrides any other registered modifier for that type. This means, if you are not careful, that you can break editing floats for all users... Additionally, the automatic selection in the registries is based on most specific type, so inheritance must be taken into account. That does not mean you should not share and register your modifiers, just that you should at least, communicate with the "owner" of the supported type, as the registration should be done close to where the supported type is defined (if it is in the JDK, that would be dp.core, for example). 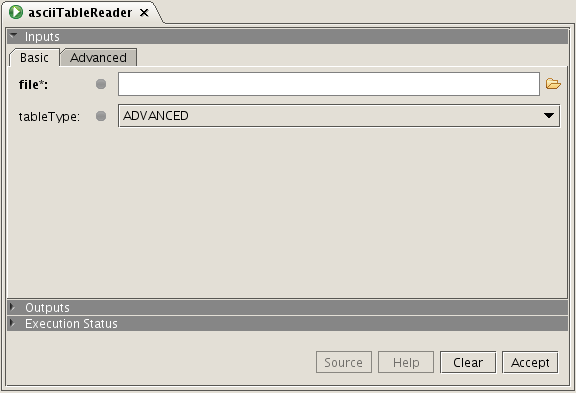 Modifiers are GUI components, so they must be created in the Event Dispatching Thread (EDT). Modifiers built in the method getCustomModifiers are ensured to comply with this rule. Creating modifiers outside getCustomModifiers is dangerous and can cause misbehaviour or even GUI freezes. Specifically, creating modifiers in the task constructor is forbidden. For more details, see the Swing threading policy . In case the default input area based on modifiers does not fit your needs, you can replace it by your own implementation, and register it so that the system opens the task dialog with your custom TaskSignatureComponent. The following sections show you how this is done. You can create a TaskSignatureComponent by extending JTaskSignatureComponent in the ia.task.gui.dialog package, and providing your own implementation of the makeModifierMap() method. Also if you want to also do your own layout you can extend AdbtractTaskSignatureComponent. Support the setVariableSelection for initial assignment from the Tool Window. Assign the Signature to display (setSignature). 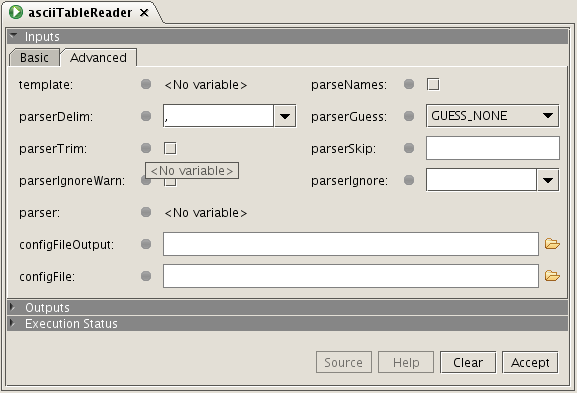 Return a map of parameters and assigned values (in Map<TaskParameter, VariableSelection> getParameters). Clear and check user inputs implementations (used by the default buttons). Implement dispose() calling dispose on all your Modifiers that implement Disposable. it provides a decorated label (including tooltip) that follows the standard style. For the function to work properly your task parameters should be fully configured (for example, the parameter description will be the tooltip of the label) if present. where you can do just that, see above Registering a Modifier. Note that you can use this function to add listeners and special behaviours to your Modifiers. The registration of the Task Signature Component is done again in the __init__.py via the Extension Registry with the usual syntax (please note the name of the factory: factory.editor.tool.task.signature). See also the Extension Registry documentation for more details. Register it to the system. Assign the Task to display (the setTask). Allow for setting the Site Event handler for notifying request of execution (the setSiteEventHandler method). Notify the execution requests calling the trigger method of herschel.ia.gui.kernel.SiteEventHandler passing a herschel.ia.gui.kernel.event.CommandExecutionRequestEvent. You can create this event through the herschel.ia.task.gui.dialog.TaskCommandExecutionEventFactory. Note that the factory uses preferences (General > Tasks > Generate task calls with a full set of parameters, to generate long or short forms for the commands). The registration of the Task Panel Component is done again in the __init__.py via the Extension Registry with the usual syntax (please note the name of the factory: factory.editor.tool.task.signature). If you have an existing task and want to make it available in HIPE, you just need to follow the steps described in the above section. Now, a task has its limitations. It is somewhat an atomic operation for which you provide some inputs and expect some result. Therefore, it is not expected for acting interactively with a user, and it is not meant for holding internal state either, that a user can modify during its execution. If you need more flexibility, you can write your own implementation of the Tool interface. Besides, you would most probably need a viewer associated to your tool, for letting the user interact with it. This follows in some way the MVC pattern: your target data is the Model, your associated viewer is the View, and your tool is the Controller. In order to write a tool, Tool interface needs to be implemented. Instead of doing it directly, it is encouraged to extend AbstractTool. More conditions for checking whether the tool can react on a particular variable can be added by providing a ParameterValidator to the prime input. The actual job to be done can be delegated to a third object (the "tool object"), or just be executed by the tool class itself. This latter case is the default; otherwise, you need to call setToolObject(Object toolObject) in your constructor. Moreover, you may return the categories you think the tool is meaningful for, by providing the proper ones in the super call. Every tool has an associated viewer, which must implement EditorComponent (by extending AbstractEditorComponent or one of its subclasses). 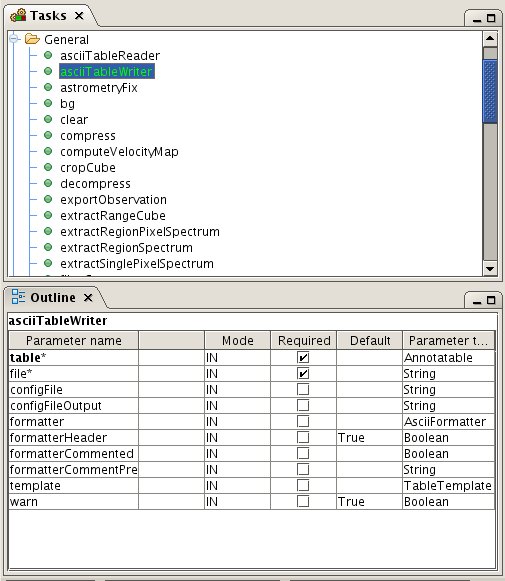 In the viewer, you can access the tool and the selected data within the makeEditorContent method provided by AbstractEditorComponent. This simple reproducible example wraps up the just explained steps altogether. 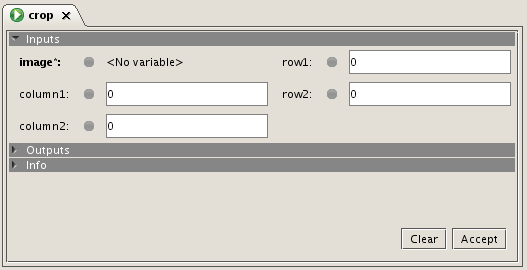 Then open the x and y variables with the Button Tool and click the button: its label is updated by the tool. For a full detailed section about triggering events have a look at DpHipeCommonUtilities. Tasks provide support for ease of evolution. During a long project some functionalities are extended, reduced or even removed. The basic mechanism involves keeping a deprecated copy than informs, complains and guides until the removal. This is an extract of the information contained in the Task FAQ. A new String attribute deprecatedWith for tasks. When executed, it will throw a warning and a log message. Default GUI will show this message too. TaskUtil.makeDoc(task) will add deprecation message too for removals. Note that doc is effectively "final" (only read once by Jython). Task View will show deprecation info in the tooltip. Outline will show the deprecation. New String attributes deprecatedWith and deprecates for task parameters. When executed, your preamble will "update" user code and log a warning. 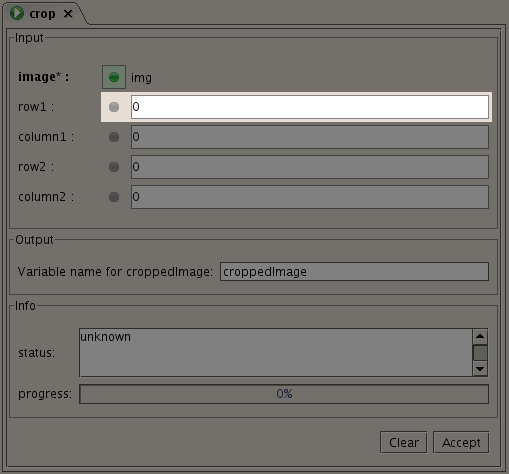 Default GUI will not use deprecated parameters. TaskUtil.makeDoc(task) will add deprecation info to deprecated parameters. Changing the name of a task. Rename the parameter to the NEWNAME. Copy the parameter at the end of the signature (with the old name OLDNAME) as optional and without a default value and set the value of the deprecatedWith attribute. Add a preamble to your task that copies values from OLDNAME parameter to NEWNAME parameter and logs warnings. It should call the parent preamble at the end. Add info to the Registry of removed names for taskname.OLDNAME and do not forget to update JExamples and JTags (or other documentation). Rename the task (NEWNAME, both in source and init.py). Add another instance in the init.py , changing the name (OLDNAME) and deprecatedWith attributes. Export this "new" (but with the old name) task instance, but do not register it. Add info to the Registry of removed names either now or when you finally remove the OLDNAME instance. Set deprecatedWith before calling makeDoc. Remove registration from init.py (but keep imports). Once the deprecation period is over, all the code (source, init) will be removed and info added to the Registry of removed names.